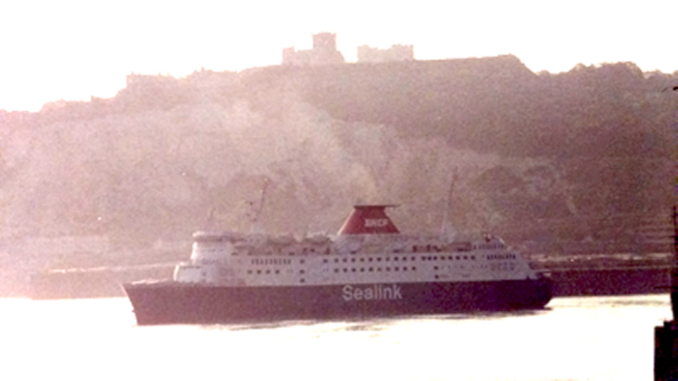 On a previous trip across the English Channel many years ago, I was returning to England via Calais to Dover on the ferry as a foot passenger. I was sat on deck minding my own business when an Arab gentleman of a North African appearance sat beside me and we fell into a rather awkward conversation, me being a bit of an ‘enjoy my own company’ kind of travelling gentlemen. This was one of those old fashioned ferry trips where French school children would sit about in small groups smoking cigarettes and summarising Descartes, while the English children charged around the decks, fighting with all the things they’d bought in France (fireworks, flick knives, CS gas) that they weren’t allowed in England. The North African introduced himself as Mohammed. Now Mohammed’s mother doted on him and had sent him on his way to England with a tin box full of cakes which sat on his knee. He opened it up and offered me one , which out of politeness I ate. Sure enough, on disembarking, Mohammed was weighed down with bags and boxes and asked me if I could carry dear old mama’s cake tin for him. Which of course I did. He would catch up with me on the other side of customs. Need I repeat that, dear reader? I will anyway and put it between inverted commas, “other side of customs”. Of course I wandered off with his tin and hung about until I spotted him near a customs officer and then gave it back to him in a big loud voice siting having to dash for a train. He turned white and began to shake as he took it off me. Obviously the best couriers don’t realise they’re couriers. They can’t act suspiciously because they don’t realise they’re suspicious and they don’t have much to tell when they’re caught. Having said that you’d have to be pretty thick not to realise what’s going on and having also said that, there does seem to be a small regiment of dim girls from the English provinces in jail in places like Columbia, Thailand and Egypt. As our story continues I’m leaving Ankara in the early evening, by train, heading south east toward the Syrian border, to a city called Adana. It’s towards the Western side of a ‘rat run’ that goes from Iraq to the port of Mersin in the Eastern Mediterranean along which oil and materiel run back and forward to an Iraq which is embargoed because of the Iran Iraq war. For extra fun it passes the main gate of the American Air Force base at Incirlik and to put some icing on the cake, Saddam Hussein uses it to smuggle atom bomb components. Having established previously that your author is no great writer I need not explain that he’s no photographer either. At this point deep into Forbidden Zones and likely the only white man east of Ankara, I want to attract as little attention as possible. With my camera firmly hidden in the bottom of my pack, the photographs run out. They say the best thing about radio is the pictures therefore the best thing about writing is the pictures and the sounds, from now on I must invite you to make up for my shortcomings through imagination. By the next day the train was crossing the high Anatolian plain. On the map this seems like dessert but in the middle distance a light haze of green hangs above the land from thin sparse straggly grass. In the far distance were high snow capped mountains. At times the train crawled, attracting sharp eyed vultures to hover above us in the thermals from the warming land. Passing near villages there were boys out with hunting dogs. By early afternoon we’d reached the Taurus mountains whose gorges were a gateway through to the Eastern Mediterranean. In the United States there is a continental divide which separates the flow of water between the Atlantic and the Pacific. Likewise, perhaps somewhere between Kayseri and Nidge there is an undrawn line which describes Belgrade, Munich, Paris and the like as insignificant and a new world entered where affairs revolve around Damascus, Beirut, Aleppo and Tel Aviv. While locking horns with the Taurus mountains some of the climbs were superhuman. The Germans built this railway from Istanbul to Mecca for their Turkish allies as the Caliphate’s uniting beltway from the fatally distant Sultan in Istanbul to the holy places in Mecca and Medina. Just as it seemed that the train would rock and sway until it fell off the end of the world the mountains had given way to a coastal plain and a millipede line of carriages crossed the cotton fields next to the four ploughed furrowed curves of the oil pipelines to Iraq. We were arriving in Adana, about six hours late. At the railway station there was a Cowan Sheldon breakdown train and the rails were stamped with ‘BSC Workington’. I had just missed steam services which had been replaced by shiny new American EMD’s, some still in their wrappers. Three decades later another English gentleman of a certain occupation, chap called James Bond (you may have heard of him) jumped off a bridge in Skyfall’s Istanbul and, with the licence allowed for the telling of a good tale, landed on the roof of a train in Adana with, sure enough, the Cowan’s train still sat there in it’s breakdown siding. 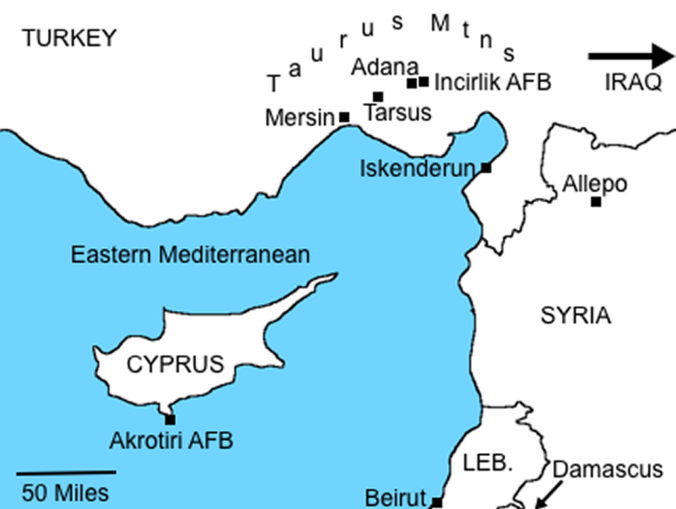 Adana was a lot more than the one horse town it appeared to be via the dot on the map. Outside the station was a broad dual carriage way and boulevards peppered with high rise buildings. I pitched camp in a street cafe next to the road. It being daylight and Ramadan it was deserted. I pointed to some words on the menu and ate kebabs on skewers with salad, washed down by cloudy un-chilled water. Over this ‘dysentery special’ I had a chance to congratulate myself on getting further than my predecessor, who had got into a bit of a tangle on the barbed wire between Syria and Turkey. Behind every great promotion there’s a sense of ‘muggins turn’ or ‘all else has failed’ or ‘nobody else wants to do it’. My predecessor had approached via the Syrian coast on an educational cruise for French school children. He never taught any lessons, seemed to despise children (no bad thing in a teacher), spoke a kind of pigeon French, spent an awful lot of time alone in his cabin and went missing on the coach trip to the Crusader’s castle in Aleppo without anybody senior seeming to know or care. In fact the headmaster and the captain of the ship seemed to be rather pleased to be shot of him. At the time, diplomatic relations had been severed between Britain and Syria as a Syrian national had tricked an Irish national into taking a package containing a semtex charge onto a flight at Heathrow. Although she got through British security she didn’t get through El Al’s, setting in motion a sequence if events resulting in my colleague being stuck in Syria and, although too modest to mention the extreme danger himself, was very nearly caught and bartered around the region as a hostage. Satisfyingly I was not only much closer to the target but had soon found some accommodations in a men’s dormitory of eight steel framed beds on one of the upper floors of a hostel. I was the only guest. There was a bathroom cubicle with a toilet pipe, advisory footprints, torn up newspaper, an unreliable tap and a jug of cold water. By this point I was starting to get Turkish tummy and finding it difficult to cope with the mess. Stuffing the dirty newspaper into the pipe just blocked it up so I gouged it all out again. There was no bin but there was an open window so I stood up on tiptoes, compacted it all up into a ball and threw it out. Walking out of the hostel a couple of minutes later, there was pandemonium in the street as a table of domino players tried to clear up the fallout caused by what can only be described as a diarrhoea bomb, landing from the fourth floor, slap bang in the middle of their game. One of the tricks to being invisible is to pretend that you don’t realise anything has happened whilst looking in a different direction. This was made all the easier by there being, on the next table, the strangest thing I have ever seen. There were only two uniforms for gentlemen, baggy shirt and pantaloons, or grey suit with collarless white shirt. Sure enough there were two domino players in identical shirts and pantaloons with completely identical facial Turkish features. They were twins. And they were (wait for it, drum roll) albinos. With identical white hair, completely pale skin and red eyes. Obviously I stood and stared, while they stood and stared back, no doubt thinking who’s that freak with the blue eyes? Is the circus back in town already? And Adana was a great place to be. Lack of street lights allowed for an outdoor cinema. The screen was huge, i.e. a long, high concrete wall. Rows and rows of children sat cross legged at the front on the grass and behind them sat rows and rows of adults on benches. If you think Cowboys and Indians is too violent you’ve never seen a Turks and Arabs. The Turks were dug in in trenches with rifles. And the Arabs were in the distance just before first light, assembling their cavalry. The audience were sat in rows, in the dark, under the stars just behind the first couple of Turkish trenches. In other words it was like being in the film. When the Arabs charged there wasn’t much we, or the Turkish infantry, could do except watch and wait. By the time they were in range not many rounds could go in before they were upon us. By this time the children sat the front had lost their discipline, were on the move, screaming and wetting themselves. When the first line of Arabs drew their swords, hung off their reins and began lobbing of Turkish heads with sabres, I was screaming too. And there was a football team called Adanaspor who, presumably because they were in competition with the cinema, sacrificed a goat on the centre circle before every match. The puppet theatre was in town as well. The puppeteers travelled around the country and would stay for a week telling the same continuous story each night. There was no written script, it was all learned. The youngsters travelling with the puppeteers would sit at the front swaying backwards and forwards to help them learn the script, like boys swaying back and forward learning the Koran in the madrassa. The puppets themselves were two dimensional and held up and operated by hard straight wires behind a scenic screen. I had to confess to a chap sat next to me that I couldn’t understand much of the language. He told me that nobody else could either as it was in an old Turkish. In order to modernise Turkey between the wars Ataturk had introduced the Western, Latin alphabet and a lot of German words. He’d also moved Thursday and renamed Sunday as Friday (I think) to line up the working and holy days of the week with an enviously more progressive Europe. The chap sat next to me then made an important point about the puppets being realer than real, as you could actually see the wires moving the puppets, whereas who knows what forces control the flesh and blood puppets sat around us. A clever chap and a timely reminder, dear tax payer, that you weren’t paying me to enjoy myself but to make headway to the port of Mersin where I had an appointment with bits of that nasty man Saddam Hussain’s atom bomb.